When Redwood Hill Farm’s Jennifer Bice took over her family’s goat dairy and creamery in 1978, she faced a truly uphill battle. “I would do goat cheese demos at stores or farmers markets and people would start backing away or gagging at the sound of it,” she recalls. 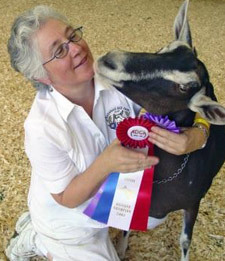 Since the goat industry (if you can call it that) has no trade groups, Jennifer recently joined two other makers of goat’s milk products, Laura Howard, of Laloo’s Goat’s Milk Ice Cream and Mary Keehn of Cypress Grove Chevre, to create an educational campaign and website called SuperGoat, to bring more awareness to the “other” dairy. Because there are no known Concentrated Animal Feeding Operations (CAFOs) for goats to date, the products made from their milk tend to be both humane and more ecologically friendly than other dairy. 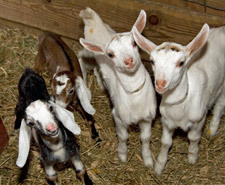 According to the SuperGoat website, “goats don’t decimate the land or pollute the air nearly as much as cows. They are light on their feet and because they are smaller they don’t require as much energy, food or land.” In addition, the kinds of growth hormones that are commonly used on cows have never been developed for dairy goats. Another big environmental plus is the nature of their manure, which is pellet-like and doesn’t require large open-air lagoons like those needed to store cow manure. Even as the market for goat cheese and other goat products grows, Jennifer says, there’s still little chance that it will ever resemble the cow dairy industry. One reason, she points out, is that it takes 10 goats to produce the milk of one cow, meaning goat products will always require much more labor. Add to that the fact that there are no government subsidies for goat farmers, and the limits to scaling up are clear. On the one hand, this means it’s unlikely the price of goat products will ever get to be as low as cow dairy; on the other hand, the businesses are not likely to become industrial-scale operations. After decades of inroads into the market by goat cheese makers, products like goat’s milk yogurt and ice cream have also begun to enter the mainstream. According to Laura Howard of Laloo’s, the growing demand has to do with a rising number of people with sensitivities to cow dairy. For example, the fat molecules in goat’s milk are one-fifth the size of those that make up cow’s milk, and goat’s milk does not contain alpha S1 casein protein, the most common allergen in dairy products. Both factors make it much easier to digest for many with allergies and lactose intolerance.